A picture of the plane’s been published, though from afar and pixellated, as it was parked next to a hangar somewhere in “the center of the country.” It is being renovated for its new role in the coming year. The censor prohibits most details about the plane, even though it’s existence has been reported in recent days in virtually every international aviation publication. We know that the plane is a regular civilian model which tens of thousands of Israeli fly from airports around the world. It’s been leased from a foreign company and is 20-odd years old. For the past year, it’s been outfitted with special systems including communications, self-defense, and others which would enable the prime minister to fulfill his role fully while in the air. The interior will be renovated in a luxurious manner befitting a VIP residence. The plane will include meeting rooms and rest areas. Besides VIPs and family, there will be room for 100 more passengers. The contractual details with the foreign leasing company. The identity of the company performing the renovation. Enumerate the specialized equipment with which the prime minister’s plane is being retrofitted. The financial particulars: lease, renovation and maintenance costs. Never fear, that day is upon us. An Israeli source has resolved a few of the mysteries. The plane is a Boeing 767-300ER. The retrofitting upgrade is being performed by Israel Aircraft Industries, one of Israel’s major aviation defense contractors. Contrary to what’s reported above, Ynet has estimated the cost of purchasing the plane at $70-million. Retrofitting it will cost another $40-million and regular maintenance will cost $30-million. That comes out to a cool $140-million. Note the veiled sarcastic tone of the above passage when it says details are being censored “certainly” for security reasons. This wink-wink, nudge-nudge approach alludes to the real reason for the secrecy. It’s not to maintain the security of the plane or the retrofitting project. Nor to conceal the high tech gear or self-defense systems being installed. It’s to protect the profligate prime minister from having another one of his boondoggle projects exposed to the public. A year ago or so Sarah Netanyahu became so disgusted with the shabby sleepy arrangements aboard the current Israeli Air Force One (a ‘mere’ Boeing 707) that she spent $130,000 to build a and install new bed. The public whistled and howled in derision. I have little doubt that Sarah is the chief instigator of this project as well. It’s become a tribute to her vanity. She acts more like a spoiled Roman emperor’s wife than a simple Israeli politician’s spouse. If this were those ancient days, I have little doubt that those who cross her would end up facing the lions at the Roman circus. Ynet also reports that Netanyahu has decreed a new prime minister’s residence must be built as his current one appears too rundown and shabby. Cost for this little project: $175-million! The claim by the prime minister that the president will also get to use it is a smokescreen that’s meant to soften the blow. Pres. 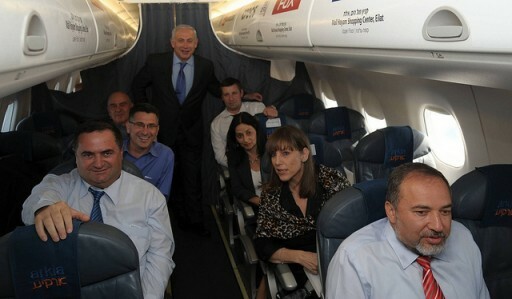 Rivlin has never complained about his current air transport. He’s never so much as asked for a new chair, let alone a new bed or plane. Many politicians who serve their countries over long periods seek to leave a legacy for their nation. Some build transport networks or new cities. Others build palaces, fleets or armies to protect the country. What will Bibi leave? Some beat up furniture, a gleaming villa in Jerusalem befitting an emperor, and an aerial boondoggle. I believe that 70 million USD is the cost of -just- the used jet. There is also an annual maintenance budget of 30 million NIS. It is nice to be able to read details about the project which Israeli papers don’t publish. But then you miscorrectly wrote that Israel uses an 707. The truth is, Israel has no Air Force One . Like the YNet article above says – “Israeli heads of state have in the past relied on Boeing 707 planes for their travels. However, this tradition was discontinued due to the planes becoming outdated and their high fuel consumption.” The 130K$ expense was for a whole trip, fuel, pilots etc’ not renovation. According to this article (http://www.jpost.com/Diplomacy-and-Politics/Israel-to-get-its-own-version-of-Air-Force-One-351270), last time the 707 was used was in 2001. According to this one (http://www.haaretz.com/print-edition/business/israel-air-force-one-state-considering-official-plane-1.4583), in hasn’t been used for a several years prior to 2009. I don’t think we need one but regardless, at least now the facts are clear. @ Danny: Israel leases a plane from El Al for travel by the prime minister. I don’t care if you call it Air Force 1 or Aunt Betty’s Buggy. You’d know that if you’d read the article linked in this post. Which is why I tell commenters disagreeing with me to read ALL THE LINKED ARTICLES before commenting. It will save you making mistakes and save me having to waste my time pointing out your errors. at least now the facts are clear. Yeah, as clear as mud! It isn’t about name calling but about facts. Israel currently doesn’t own a plane for PM/president/ministers transport. And it didn’t use a 707 for over a decade for such task. Not only you haven’t mentioned Israeli government currently leases planes for this, but you presented it as if it owns one.
. I wonder what the two airforce one planes cost including all the staff and maintenance. Now the truth is Its me who is an idiot. Why would I as somebody who loves Israel be reading your blog…. @ Danny: you’re the hasbara police. Your job is to find errors. So you deserve no thanks for anything. I note no apology for my exposing your own error about the cost of the bed. How about this: when you apologize for your reign of error & promise you’ll read every link on every post on which you comment BEFORE you comment, then I’ll thank you for catching one minor error here. Deal – I have made a mistake. The 127k is for the bed itself. The Time article isn’t super clear about it but here (http://www.timesofisrael.com/netanyahu-slammed-for-spending-127000-on-bed-for-flight-to-london/) one can see the total cost grew from 300k to 427k which clarifies that number. The error you made isn’t just a silly detail in the whole picture. It is the whole picture. Bibi isn’t looking to replace ‘his’ current jet with a newer, nicer one but rather buy one after Israel retired the old 707 from this mission. Can’t you see how that changes everything??? Personally I believe it doesn’t make any financial sense and will end up costing more of my tax money. Trump can buy whatever plane he wants with his billions. Bibi shouldn’t. The above picture isn’t from “current Israeli Air Force 1” but a plane that was leased from Arkia as you can see on the seats. Is the lower picture from the actual new airplane? @Danny: No, it changes nothing. The government leased a perfectly serviceable plane from El Al that serves this purpose well. Instead Bibi proposes spending $140-million on a vanity boondoggle so Sarah can have a good night’s sleep & fly in luxury. it’s obscene. @Danny: Do you think if there is secrecy surrounding this deal they would permit any pics of the new plane? The story may be entirely different from what you are focused on. The plane is a 767-300, the same model that ELAL is retiring. Is this one of the retired aircraft? If so, is the price, the correct price for a 30 year old plane? If not, who benefits from the difference and why? Where is my thank you? I’m sure the US will pay for this. You gave me your word! @ Danny: I made a minor error. Isn’t the first time & won’t be the last. So sue me. With those faces it should be called “Derp Force 1”, Lieberman looks like he is playing a video game beyond the picture frame. Israel doesn’t lease one specific aircraft, rather every trip requires a new tender be issued. That works for mid-range flights where all three Israeli airlines can compete, but for long-range flights, only ElAl is capable of flying, and Israel’s media has in the past alleged that the airline took advantage of the monopoly to charge unreasonable prices. Danny’s correction is not about “hasbara”, and so calling him that or other names detracts from the anti-Bibi case. You’re human Richard, and made a mistake; correct it, thank him, move on, no? FYI the approved budget for the aircraft is $47.9 M, so that is at least somewhat less expensive than initially thought. You’re human Richard, and made a mistake; correct it, thank him, move on, no? No. Nor do I need concern trolls weighing in on the matter. When I need advice on making apologies or admitting mistakes I’ll ask you. But I didn’t. And if the budget for the plane has been lowered (you’ve provided no source so I don’t know that your claim is accurate), that’s very easy to explain. It aroused so much outrage that Bibi told them to lower the price. They did. Now the extra $25M they lopped off the price will be padded into a different budget item or line. The vendor will make it up in different ways.